How did Kimchi kick off? It’s a funny story… I was in a relationship with a person and made a passive-aggressive complaint to him in the form of a comic. But it was a happy every after, because his response was that I am HILARIOUS and should immediately start a web comic about polyamory. Seriously I doubted. But I tried it anyway just to see, and I’m continually amazed by how much love and support I receive from strangers all over the world who read it daily. I started just doing stand-alone comics before I really developed the characters, but it evolved over the first 30 comics into having an ongoing story following issues involving each character. The plot line is complicated now but people can keep track by looking at the “Character Polycule” page on my website. But there are spoilers if you aren’t caught up with all the comics! I try to cover a wide variety of themes, to show the innocent humanity behind different sorts of conflicts and joys that arise within relationships. All sorts of poly relationships are shown, and I also cover a lot of trans/genderqueer issues. I’m very passionate about spreading understanding about poly and genderqueer issues. Have any of your friends had problems being depicted in your cartoons? No, surprisingly. Even the person who Soliloquy is based on brags that she’s in the comic (she’s an ex-girlfriend of mine that I may have been mad at when making some of the comics). Most of the people who are depicted in the comic read the comic daily and enjoy it, and even email me suggestions/stories! It probably helps that I love all my exes and think they’re awesome. How true to life is it? All the characters are based on real people, and if you know any of them in real life it’s extra hilarious. The stories are also true but they’re switched around among the characters differently than how it actually happened. For example, I have the Soliloquy/Baxter/Marco/Crystal quad cover a lot of issues that came up in my own quad I had with the people Soliloquy and Baxter were originally based on. But now those same characters also cover other issues, from relationships with different people. My husband actually has two characters that are based on him (Vajra and Sherman), but Sherman is also partially based on a different ex-lover of mine. Kimchi is all me, but little pieces of me also exist in Nora, Lilly, and Marco. 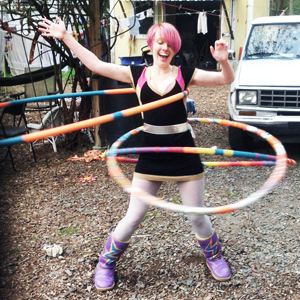 How into hula hooping are you? What does it bring to your life? I love hula hooping. Pretty much the only time I don’t feel awkward in my body is when I’m hoop dancing in a bikini by a bonfire to tribal drumming. What’s with the enneagram obsession! Oh don’t get me started! Well, apart from just thinking it’s interesting to study, I’ve also used the enneagram in combination with thought-inquiry meditations in order to overcome deep anxieties that I’d held on to for most of my life. It’s helped me see that my version of reality is just one of many interpretations, and has made all of my anxieties less solid. Will you be publishing a cartoon book? I hope to start a kickstarter (or something like that) to create some sort of coffee table book, hopefully before the Spring. Finding time is always the biggest barrier to these sorts of projects! The comic just started a new season, and is now much more autobiographical than any of the comics that have come before. Everything that’s happening with Kimchi this season (and with the new characters surrounding her) is about my current, actual life. Interested in Xmas shopping for those other significant others in your life? Go to Kimchi Cuddles Shop.